I know, I know. There are approximately 3.6 billion articles on this subject floating around the internet. So what makes this article special? Well, I just learned a few things about how the body uses glycogen and fat that I’ve never heard before. People who are into running or bodybuilding may have come across this information, but it’s almost never presented in a way that shows you how to utilize it for fat loss. Discussions about glycogen almost always revolve around maximizing workout performance, not weight loss. There’s a lot of talk about carbs being responsible for obesity. I watched a presentation given by Robert H. Lustig, MD. entitled, “Sugar: The Bitter Truth” where he went over the exact processes the body uses to turn carbs into fat. Lustig went on to blame the obesity epidemic on sugar. He does make some strong arguments, but he leaves out some critical information that everyone should be aware of. The body uses glycogen, which is a type of sugar, as its preferred fuel source. 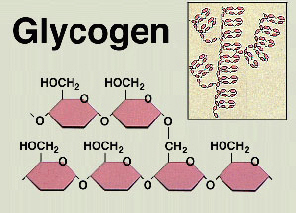 Glycogen is produced and stored when dietary carbohydrates are consumed. The body’s process of turning carbs into fat is called de novo lipogenesis. The process of lipogenesis can be measured by monitoring biomarkers in the blood. There was a study done back in 1988, where researchers put a group of men on a controlled diet. During the study, they first depleted the men’s glycogen stores and then overfed them with carbohydrates on a fat free diet to monitor how their bodies reacted and to figure out when lipogenesis began to occur. There’s a great in-depth review of this study on YouTube here. This study provides us with one key piece of information: They found that lipogenesis didn’t begin until the body’s glycogen stores had become saturated. So essentially these men could eat a pile of fat free carbs and not put on any fat, as long as they never fully saturated their glycogen stores. However, once the glycogen stores were full, their bodies piled on fat like crazy, gaining 1.1 kg of fat in a few days. This vital piece of information can allow you to precisely control your weight without having to starve yourself silly. Allow me to explain. Basically speaking, when the body has enough glycogen to fuel its energy needs, it takes any dietary fat that is consumed and deposits it into fat cells for later use. The body doesn’t reach into those fat cells for fuel until it runs out of glycogen to burn. When the body uses up its glycogen stores, say after a hard workout or a long night’s sleep, the body turns to its fat stores to provide energy. It’s easy to burn glycogen through exercise, but it’s incredibly difficult to burn fat from exercise alone. This key fact is why exercise is so important to losing weight. When people combine a low fat high carb diet with exercise, they can consume huge amounts of carbohydrates yet not gain a pound. In fact, they can lose fat while they sleep. The researchers also found that glycogen stores became saturated after about 500 grams of carbohydrates were consumed. This is another key point, because it allows us to determine just how much we need to workout in proportion to how many carbs we consume. I’ll do some calculations here in a minute to demonstrate what I’m talking about. So let’s put this information into practice. Assuming we are eating a diet of 3-5% fat, 85% carbs and 10% protein, which happens to be roughly what a potato provides, let’s see how many medium sized potatoes we could eat before we started to pile on fat. According to Google, a medium sized potato has 163 calories and 37 grams of carbs. A person would have to consume 13.5 potatoes before they hit 500 grams of carbs and saturated their glycogen stores, assuming their glycogen stores were empty to begin with. That’s a lot of potatoes! And the calorie total only comes to 2200! Potatoes really are the perfect diet food. So let’s say a person really wants to be a glutton. Lets assume they consume all 13.5 potatoes for breakfast, after fasting for a day, to fully replenish their glycogen stores. According to this research, if they then did just 20 minutes of relatively intense running (80% VO2 max), they could burn off half their glycogen stores, allowing them to eat another 6 whole potatoes for lunch and dinner without putting on a pound. According to this research, one hour of intense exercise could fully deplete your glycogen stores, as could 2 hours of moderate exercise. Light exercise doesn’t seem to do much to glycogen stores. These facts show us just how potent the diet and exercise combo can be when a low fat high carb diet is followed. People really can eat as much as they want and still lose weight, as long as they are eating a very low fat high carb diet and put in enough exercise to deplete their glycogen stores between meals. As we can see from the charts, the amount of exercise required really isn’t anything too crazy. This information also makes it clear why eating a large breakfast and a small dinner makes the most sense, and why eating a high fat diet is a bad idea. Since you are up and moving during the day, the body can be busy burning glycogen from a carb loaded breakfast and lunch. While at the end of the day, glycogen stores will be depleted, allowing you to burn fat during the fasting period of sleep. The reason why a good night of rest then becomes important is also made clear. The longer you sleep, the longer the fasting, the more fat the body will burn before carbs are once again ingested. Taking this one step further, we could tinker with the proportions of carbs and protein. It seems the ideal diet would be one where pure carbs are consumed for breakfast and lunch, while a high protein, low fat, low carb plant based meal for dinner (greens and beans) would be optimal, as this would extend the period of depleted glycogen even further, causing more fat to be burned. These studies totally changed the way I looked at diet an exercise unlike anything else I’ve ever read before. There’s a mountain of information on how much glycogen various exercise burns because all the runners out there are very interested in this information. So with a little bit of digging, you should be able to customize a diet that meets your caloric needs while keeping you full and burning fat while you sleep at the same time.